Pill form is the most palatable way to consume your placenta, according to most women. The process includes either steaming the placenta with a water bath of ginger root, Szechuan Pepper, and lemon wedges, then dehydrating the placenta as prepared in Traditional Chinese Medicine (TCM) or simply dehydrating it from it's raw state (Raw Method). 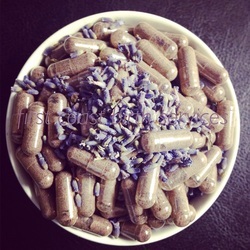 After the placenta has completely dehydrated, it is ground into a fine powder and placed into capsules. One placenta can yield anywhere from 75-150 pills, respectively. Once created the pills can last in a cool dark place for 6 months and if not used within 6 months can be stored in the freezer for years. Most women choose to consume their pills within the first year of their baby's life. The benefits of taking these pills can include increased energy, increased milk supply, easier mood transition, and increased immunity. Click for more information on the placenta's healing properties. improved sense of well being I experienced was remarkable an worth the investment. I was afraid I would suffer from postpartum depression the second time around and after taking these pills I didn't have any issues. I highly recommend Laci's services. I loved how this tincture helped me balance my hormones when my cycle returned after I had my baby. I'm so happy I had it! A small part of your placenta is added to a high quality alcohol and sits for up to 6 weeks. During this time the healing properties of the placenta are brought out. If stored properly, it can last indefinitely. It is thought this tincture will stabilize hormones during your cycle and menopause. Accounts have outlined mental, emotional, and psychological benefits. 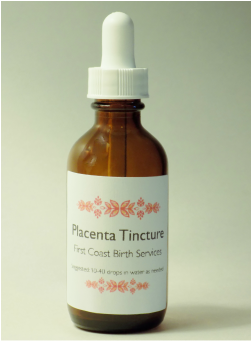 Lactation Tincture without placenta also available. This extremely potent tincture contains galactagogues proven to increase the production of milk in lactating mothers. Ingredients: Blessed Thistle, Fenugreek, Marshmallow Root, and Red Raspberry Leaf. If you are looking for another way to eat your placenta, try these easy to use smoothie cubes. Your placenta will be pureed and poured into ice cube molds, frozen, individually wrapped, and ready for use in your favorite smoothie recipe. After your placenta has been dehydrated and ground it is added to a mixture of vitamin E, infused herbal olive oil, and bees-wax. This herbal ointment is very soothing to the skin and can be used on minor cuts, bruises, burns, bites, scars (such as stretch marks; c-section scars), and rashes. This is a unique placenta planting kit made by the New Zealand based company Birth to Earth. If you want to plant your placenta instead of consume it for its healing properties, consider using this 100% biodegradable placenta capsule under a tree of your choice. These prints make a lovely keepsake for you and your family to cherish. The print can be used directly on artist's paper using just the placenta or food grade coloring to make a unique Tree of Life Artist Print which can be framed. These prints can be done on canvas, as well. Any purchase of Placenta Pills comes with a complimentary cord keepsake for you and your baby. Depending on the length of the cord, it can be bent and dehydrated into different sentimental words or shapes. When you are lactating, you will need to consume more calories than you did when you were pregnant. An average of 500 more calories than if you were not pregnant or breastfeeding. Make sure to consult with your lactation consultant or midwife for lactation issues. Never skip a feeding and drink lots of water while breastfeeding. These desserts are packed full of nutrients that have been known to boost supply for many women. On top of that, they taste amazing. I look forward to updating this section frequently. Ask me about VEGAN options. I aim to please all the Mamas. Large Chocolate Booby Brownie! Warm and fudgy brownie made fresh to order and will be delivered upon arrival to prepare your placenta! What better way to satiate your post-birth appetite? Oatmeal Chocolate Chip Cookie Cups! Soft and chewy and straight from Mama's kitchen. Enhanced with nutrients to help your milk be even more abundant and nutritious. Everyone in your family will love these! Vegan and Gluten Free option is available. Enjoy any of our lactation cookies in a jar! Great for baby showers and postpartum gifts. Ask about different lactation recipes available! Makes about 2 dozen cookies depending on size. Vegan options and gluten free options are available. Looking for the perfect baby shower gift? Gift certificates are available.